My favorite things I brought home were the picture frames!! If I could go back to that day, I'd have gotten more ~ Dad had literally hundreds of frames to get rid of. I just grabbed a couple that caught my eye. My favorites were two that had a blue, weathered finish and mats inside - one a light blue, one navy blue. Once we got home, I tried a few pictures in them, but couldn't find any that really worked with the color of the frame. What to do? Isn't it pretty? I like the bumpy texture and different colors in the burlap. So perfect for summer! So, now it's on to frame two. 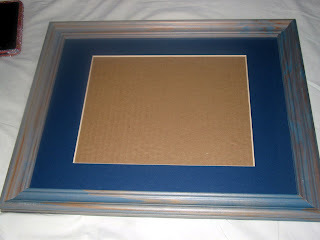 While blogsurfing yesterday I saw a frame with pretty scrapbook paper in it being used as a dry erase board. (SO sorry to not remember whose blog I saw that on ~ if it was yours, PLEASE leave a comment so I can give you credit!!) That's what I decided to make. Since mine had the mat, I decided to leave it in there and put my paper in the middle, like a picture. 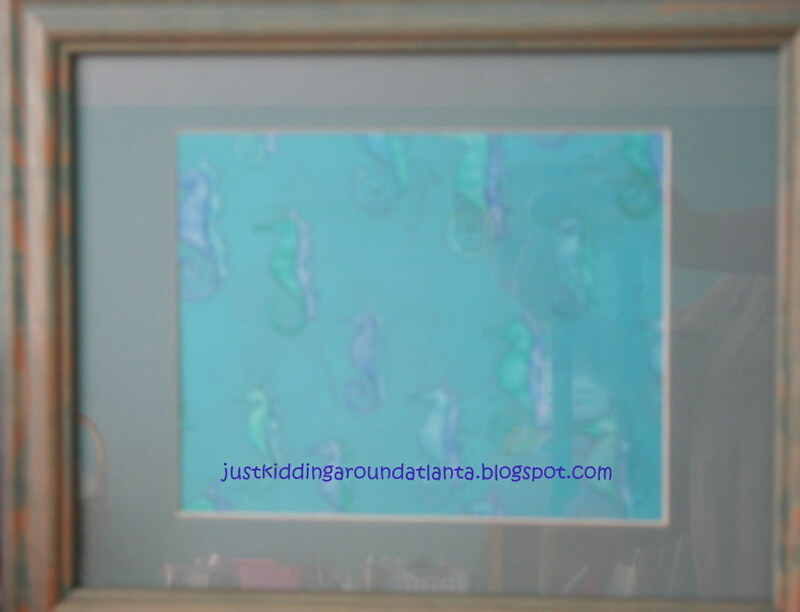 I used a coordinating seahorse scrapbooking paper. Oh, how I LOVE this!! 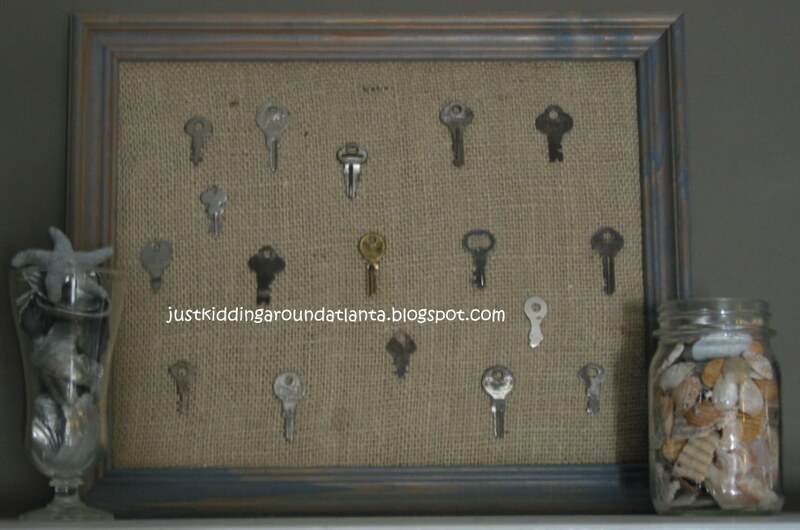 And it was FREE ~ I had the burlap, the keys, the frame and the glue. It's very summery & pretty! Here's a not-so-great picture of it, sorry for the bad quality. 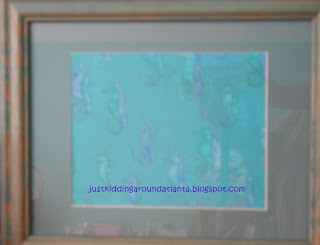 Try not to look at the mess in my craft room reflected in it, lol!! There's a second picture where I wrote on it so you could see it in action! 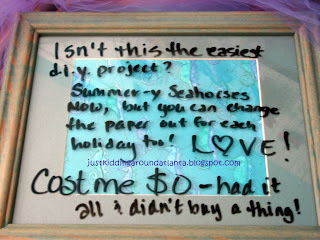 I love that I will be able to change the paper on a whim ~ back to school paper, Halloween, Fall, Thanksgiving, Christmas ~ the possibilities are ENDLESS! This will be one piece of home decor I'll never tire of. The price? FREE!!! I had the frame, the paper and the dry erase marker. 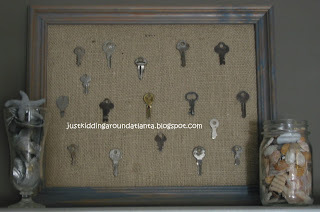 Hope you liked these easy-to-make wall decor projects!! 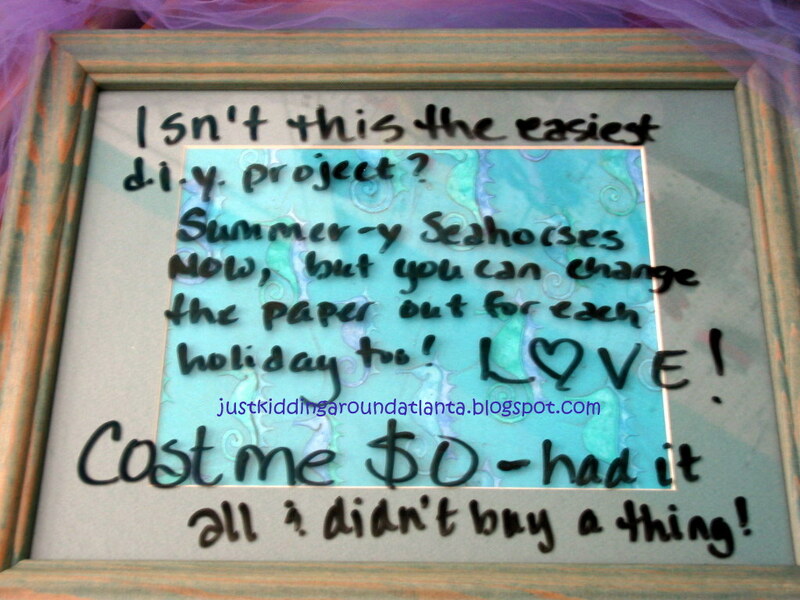 What are some of your favorite free d.i.y. projects? Linking up with Not So Moody Monday Blog Hop and Made by You Monday. Love these! They turned out great! Get a FREE Shecky's Goodie Bag!! My Mom's Krazy Krust Pie ~ the best comfort food! Super $4 Deal on Parents Magazine! My 7 year old's new favorite snack - Kale Chips! !